Nestled between Middle Andaman and South Andaman, Baratang Island is the main island in “Great Andaman Archipelago”. Baratang Island is known for the mud volcanos which recently erupted during the 2005 Tsunami. Also there are Barren Island volcano and Narcondum Volcano which are possibly active Volcanos. 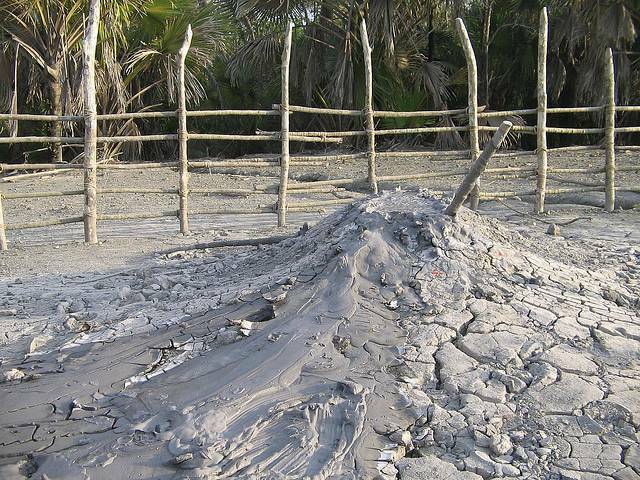 Local people call this mud volcano as "Jalki". The journey from Port Blair to Baratang Island itself will give you an enticing experience. Highly advisable to opt for conducted tour to explore the Baratang Island. The journey through Jarwah Reserve Forest is most adventurous as you can come across the Jarwah Tribes (better be warned that these tribes will hurt you with bow and arrow if you trespass them) in the forest. Remember that you cannot stop the vehicle or take a stride in forest or take a snap in the Jarwah Forest Range as it is a Reserved Forest. Also the Limestone Cave in Baratang Island is worth visiting spot in Baratang Island. Also the scene of enormous parrots returning home during sunset in Parrot Island is most amusing sight to be watched. Jetty services are available from Baratang to Parrot Island. Time restrictions apply because we need to cross restricted Jarawa Tribal areas which is only allowed in convoys at specific times.